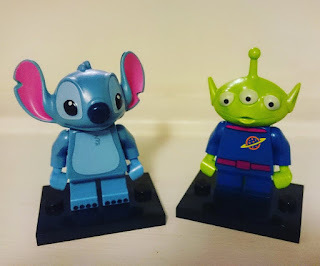 I was out shopping last night, and noticed a new Lego Minifigures Collection - DISNEY! I hadn't heard anything about this collection but oh boy I was impressed! Above is the whole new collection. Aren't there just some great choices?! My wishlist for them is Mini Mouse, Mickey Mouse, Ariel, Peter Pan, Alice In Wonderland & Buzz. They're all just too adorable! To be honest, I'd love the whole collection but we all know that isn't going to happen. These are the two I got out of the lucky dip selection. What do you think of the new Lego Minifigure collection? Are they your favourite? If not, which series was?